To ensure accuracy, we need to use have clear shared definitions of maternal health terminology. “What do we mean by maternal death?” Chou asks. “There is a definition, but the interpretation of that definition, we found in the MDG monitoring, varied widely.” Miscommunication and misunderstanding between English and Spanish definitions of the term led to “three years of political discussion—on one word,” she explains. Accuracy also requires seeking input from the most important people: the women and adolescents who are at the center of the data. “Can we make sure that everybody who needs to be at the table is at the table to think this through? For instance…when we talk about measuring essential adolescent services, what is essential? ‘Essential’ to you and me might be very different than ‘essential’ to the adolescent that we are trying to reach,” says Chou. “We have to take stock of the old, while we are moving forward and trying to look really far in the future so that we can really always make sure that things are harmonized,” Chou explains, but sometimes it is necessary to stop and understand why we are doing what we are doing. 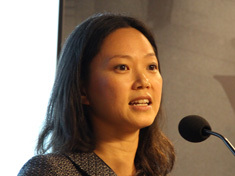 Doris Chou spoke at the Wilson Center on July 14, 2017.